This nugget of wisdom is especially true when it comes to your transformation. If you want to ensure your success, you need to prepare for it. This preparation applies to both your food and your time management. A great way to save time is by prepping meals in advance. If you take time to make healthy food in advance and have it ready to go, you'll be less likely to reach for something that'll derail your progress. By making a big batch of food and freezing portions or getting your slow cooker cranking in the morning before you head to work. Start breakfast prep the night before. Make something like overnight oats in the evening, so you can wake up to a delicious, healthy breakfast you can take with you. Or try one of these nine vegetarian options. Portion your lunches into containers and store them in your fridge. Try something like this baked salmon and baked veggies dish for something nutritious and quick at work. Don't forget to prep your snacks. Most people fall victim to the 2 pm slump and reach for whatever is convenient. With this quick formula from MyHealthyDish, even snack time will help you reach your goals. Jump on the mason jar trend and try one of these 13 make-ahead meals — from Almond Milk and Honey Porridge to the Steak Burrito Minus the Tortilla Jar. You'll be the envy of the office! Don't be afraid of the freezer! There are plenty of options you can make on Sunday, and then enjoy throughout the next few weeks. Just preheat the oven and pop in your healthy dinner. Put your workouts on your schedule and keep the appointment. If you carve out time in your schedule and plan your workouts, you'll be more likely to stick with it. Set out your workout clothes the night before so you'll be ready to go. It's an appointment you're making with yourself, and building it into your schedule helps it become a healthy habit. 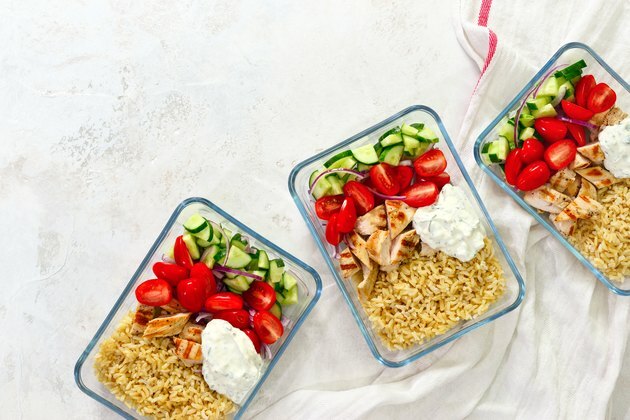 Once you've mastered the basics, take it to the next level with these 13 genius meal prep hacks to make you the queen (or king) of the kitchen. And you can always find simple, healthy recipes on LIVESTRONG.COM to help set yourself up for success. But don't be intimidated! It may seem like a lot to take on at once, but eventually, it will become part of your healthy lifestyle. Once you've mastered the basics of meal prep, you'll want to take your skills to the next level. Whether you're cooking for yourself or a family of five, here are some great time-saving tips to make sure you're always eating delicious, healthy meals without hiring a private chef. 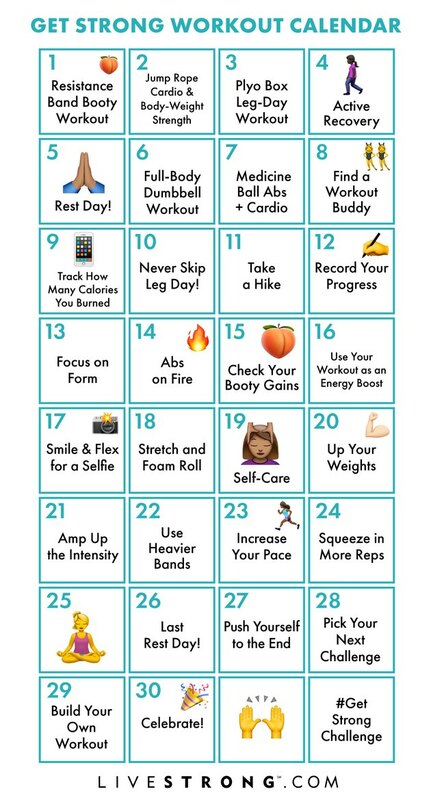 Are you a part of the Get Strong in 2019 Challenge yet? If not, here are four easy steps to make sure you're on your way to getting stronger this year. Every day, we’ll be sending you your daily workout and a healthy recipe to try, along with fun extras like workout playlists, motivational quotes, self-care tips and other fitness and nutrition information to make 2019 your best (and healthiest) year ever! Isn't it so satisfying to check things off of your to-do list? Each day during the Get Strong in 2019 Challenge, you're accountable for two main things: working out and eating healthy. To help keep you on track for the entire month, we created two calendars — one with each day’s workouts listed and another with each week’s nutrition goal and healthy recipes. 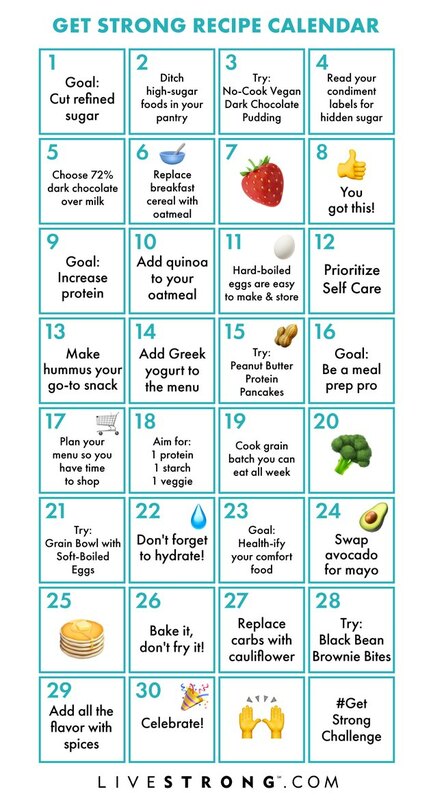 Print them out and check off each workout and day of healthy eating as you complete it. For daily support, motivation and camaraderie with LIVESTRONG.COM team members, join our Facebook Group for the Get Strong in 2019 Challenge. We'll share recipes, tips, motivations, pictures and more! Plus, we'll answer all your questions. Are you on Instagram or Twitter? So are we! And we’d love to see photos and updates of your progress. When you post to social media, be sure to use the hashtag #GetStrongChallenge. That way, you can also connect with other Get Strong challengers!